Ever misplace your car keys? How about your glasses? Ever spend 20 minutes looking for your coffee cup, only to find it sitting in the microwave?? Good– join the club! Occasionally I’ll discover a forgotten illustration in an odd folder on my computer. 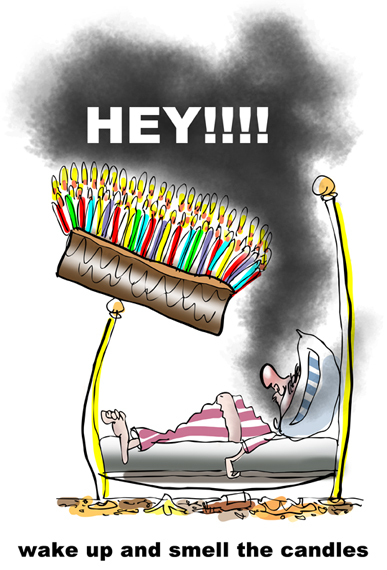 Take this birthday card design, for example. I found it by accident the other day. The idea made me laugh, but I was embarrassed about my font choice and the smoke. The “Hey…” is almost unreadable, and the smoke looks very sloppy and unconvincing. Here’s the revision. The smoke looks more realistic, and the white-on-black text really catches the eye. I added a line of reflected light on the cake, and used the same font for the “wake up” pay-off line. I know what you’re thinking: Shouldn’t the pay-off line go inside the card? You’re right. So what’s it doing on the front of the card? Good question. It’s like this: I’ll be selling the card in my online store. My fulfillment partner, Fine Art America, can only print it as a blank card. I didn’t want to lose the pay-off line, so I put it at the bottom. Not what I’d prefer, but the best I could do. Do you buy blank cards at all?– or do you prefer inside captions? 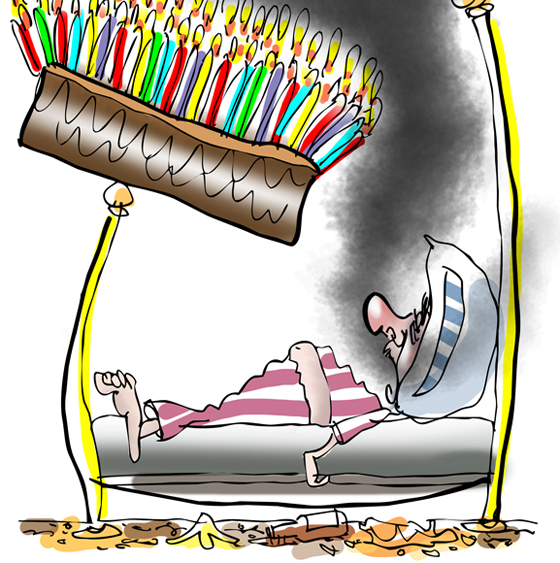 Ever had a smoke detector go off while you were in bed? 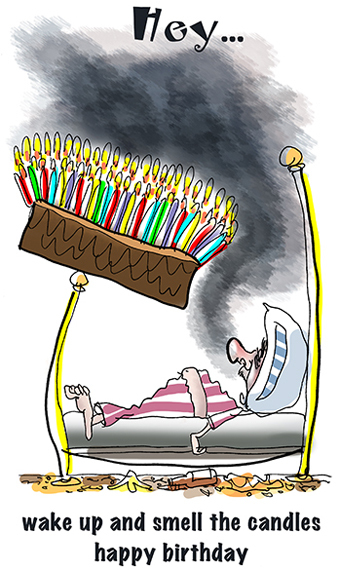 Have you ever reprimanded a birthday cake for smoking in bed?? Do you buy blank cards at all? Sure! Those are the best, IMHO, because then I get to come up with my OWN captions! Interesting that you should present a birthday image, Mark. My daughter’s birthday was last Friday. But, she only turned 12, so your image is a little closer to mine, although Cimmy stopped humoring me– doubtful that she’ll put 40 candles on a cake this August. Ha! Hi, Jak. Yes, there’s a lot to be said for coming up with one’s own captions– a must, really, for inside jokes! Good to see you, thanks as always for your kind support! 😀 Oooh, I was burning to add “candle in the wind” quips but my efforts flamed out. If I could compete with Elton John’s (…ahem, Sir to you Lady Quipster!) ability to recycle songs to suit…….that would be the icing on the cake! I sympathize with your dilemma. I prefer the punch line to be on the inside of the card. Thanks as always for your cheerful support! So much prefer the blank cards. Great illustration. I laughed out loud. Thank you for your lovely comment, Mario, and for sending me the link to your music. I thought your slideshow and your composition were both beautiful– extremely fine work. Thanks again, wishing you all the best!